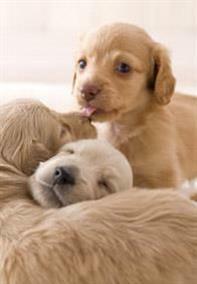 At 6–8 weeks, puppies will be fully weaned and eating 4–5 meals a day. For your puppy’s first few meals, make sure you give them what they’re used to. A sudden change in diet could lead to an upset tummy, so if you change your puppy’s food, do it gradually over several days. Because your puppy is very active, and growing, they need more than twice the calories found in adult dog food -- all packed into puppy-sized meals. The food also has to provide all the right nutrients in just the right quantities for their growing bones, joints and muscles. And your puppy’s smaller mouth may not be able to handle chunks or kibbles (biscuits) designed for fully-grown dogs. 50 years of research have gone into ensuring that Pedigree puppy food has just the right nutritional balance for a growing puppy, with the ideal ratio of protein, fats, carbohydrates, minerals and vitamins. It’s also easier for their young tummy to digest than home-prepared food. With Pedigree®, your puppy has a choice of wet food (in cans or pouches) or dry food, or a combination of wet and dry food. With dry food, you can soak it in lukewarm water for about 20 minutes at first before feeding, but most puppies will eat dry kibble without the need to soak it. And whatever your puppy eats, make sure that fresh water is available all the time. If your puppy doesn’t eat their food straight away, don't lure them with treats or offer them their food from your hand. This will only reinforce fussy habits. If they haven’t finished their food after 30 minutes, remove it and give them fresh food at the next mealtime. Your puppy will quickly learn to eat the food you put down. You can also give your dog a limited amount of training treats between meals, like Pedigree Puppy Markies®. But only give them food supplements like in case of illness or according to your vet's advice because balanced and complete puppy food contains everything puppies need to grow up to be a healthy adult dog.